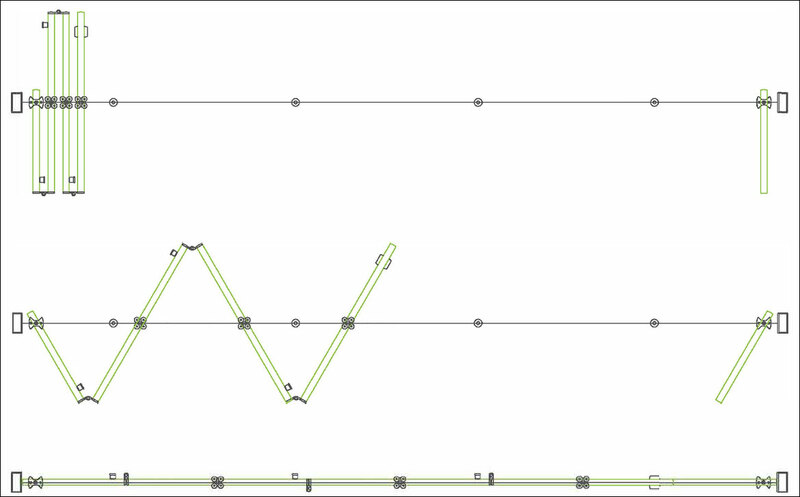 Example Diagram of a Concertina Door. For Illustration purposes only. Please find below terms that may be used on the site in product descriptions, as well as in the wider industry. If you have any questions, please do get in touch! BZP, or Bright Zinc Plating, is the process where Zinc is coated onto a metal via electroplating. This gives it a sacrificial, corrosion and rust resistant coating. This can be applied to many metals such as brass, copper and bronze, though the most common metal is Steel. BZP is often a thinner (3-25 microns thick) coating when compared to galvanising (50+ microns). BZP is more aesthetically pleasing due to a cleaner shine and more suitable for indoor use. An alternative coating method is Hot dip galvanising. A castor is a wheel – either single, double, or compound, attached to a larger object to provide mobility. These wheels are undriven, come in a variety of sizes, and can be made from rubber, plastic or stainless steel. Common applications are on office chairs and trolleys as well as widely used in materials handling such as trucks, carts, and specifically, mobile cages. Industrial – Heavy duty castors, of either rigid or swivel arrangement, designed to take heavy loads. Often connected to the object via flat top plate with bolt holes. Braked – Braked castors include a lever which prevents the wheel from turning. Within security cage direct, our most common size of castor is: 100 or 125mm or 160mm, made of rubber. A concertina door folds back on itself, and provides a safe spacing alternative to a hinged door. By folding back on itself in a ‘V’ or ‘W’ formation, the door can be slid back , reducing swing-space. These can be used for household doors, patio doors or walls, bus doors, but also on materials handling equipment such as mobile cages. These are also known as ‘Bi Fold’ or ‘Tri Fold’ doors. 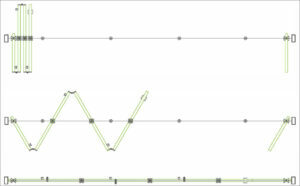 Please see an example illustration here. Epoxy Coating is a heavy duty resin coating for metal which has a greater hardness and resistance against corrosion, and is often used in industrial settings to extend the life of equipment. Galvanisation is the process of applying a protective coating of zinc to steel to prevent rust. The most common form of galvanising is Hot-Dip, where metal is lowered into a bath of molten zinc at around 450 degrees Celsius. This provides protection by preventing corrosive substances from reaching the fragile parts of the metal, and coats against scratches. If galvanised items are scratched, then exposed steel remains protected by the zinc coating. This galvanising process leads to the speckled, crystalline appearance left on the surface of the metal. Galvanised coating provides excellent long term resistance against the natural elements, often providing the best possible coating for outdoor cages. 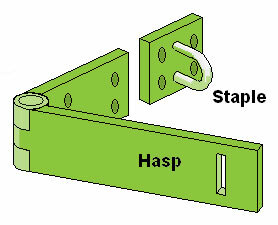 A Hasp and Staple is a simple design where a Padlock can be placed through a metal loop, securing the door closed. These are often used to secure outbuildings, and are standard fitting on our Gas and Multi-purpose security cages. A Mortice lock is a simple turn key and bolt lock that sits within the frame of a door in a ‘pocket’ cut into the door. Keys for Mortice locks are larger than cylinder locks. This type of lock is offered on our Bespoke Cages. 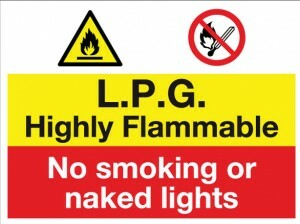 Health and Safety Signage is included with all of our gas cages. Displaying appropriate signage clearly is a Health and Safety Executive requirement. Alternative signage is available at additional cost. An example of Health and Safety Signage can be seen as the red and yellow icons with black text. Powder coating is paint applied as a dry powder that does not require a solvent to adhere – instead it is attracted to the surface through electrostatic and cured under high heat. This method allows for a superior even coating as there is no liquid to sag or drip. Similar to powder coating, nylon coating provides a non-toxic, odourless coating with chemical resistance and protection to wire mesh through a curing process. It has ideal application in the food industry due to it’s ability to be easily cleaned, and it’s chemical resistance to oils and solvents. Suitable for both internal and external applications. Stainless Steel is a steel alloy with a minimum of 10.5% chromium. It that does not readily rust or stain when in contact with water, compared to standard steel. Some staining or corrosion can still occur depending on the grade and coating of the steel. Stainless Steel is a widely used term, and covers a variety of grades and types of Steel which has corrosive or rust resistant properties. 304 – This is a consumer and industry grade steel.It is resistant to corrosion but will usually give way to corrosion after several years. It’s ease to form means common uses include cutlery, screws and machine parts. There are further variations on these types based on application. For example, 316L is a low carbon variant of 316 to immunity carbide precipitation. UDL stands for Uniformly Distributed Load. This applies mainly to shelving and provides a maximum safe weight limit based on a even distribution of products on the shelf. Avoiding a single point of the shelf baring an excessive amount of the weight reduces the stress applied to the shelf.